Teach kids to follow Jesus---Make every minute count! Check out our Sunday school curriculum, Kids Bible lessons, Children's sermons, Bible games, Christian skits, Christian craft activities, Bible memorization and evangelism ideas for elementary-aged classes, kids' church, midweek, and Bible clubs too! "But the fruit of the Spirit is love, joy, peace, patience, kindness, goodness, faithfulness, gentleness, and self-control" Galatians 5:22-23. You will need lollipops in an array of colors and flavors. I bought tootsie pops. Have each child pick out their favorite lollipop. (Encourage children sitting next to each other to choose different flavors). Tell them to place it on the table in front of them and not to open it or touch it. This is practicing SELF CONTROL. (They will probably need to be reminded not to touch it throughout the lesson. After each command explain why they are doing this). Explain that they need to wait until the lesson is over before having the lollipop. This is PATIENCE. Ask, "Does everyone like the flavor lollipop they chose?" God commands us to LOVE one another. If we love someone we want them to have the best. It’s also a way to show KINDNESS to others when we give away something we want for ourselves. Ask: Now, if we didn't like the lollipop we had, and gave it away so that we could get a better one, would that be an act of kindness or love? The answer is no, that would be selfishness. Now let's give our lollipop to the person on our left. This is GOODNESS. (Everyone should have the lollipop they chose.) We gave back the lollipops so that everyone would have their favorite. Ask. Is everyone happy? Do we feel good inside knowing that we have our favorite flavor lollipop back? This is JOY. Let’s see some big smiles. Lets be faithful by giving thanks to God for everything. Would anyone like to say a prayer before we eat? This is FAITHFULNESS. Now let’s pretend our lollipops are eggs. We have to unwrap them very gently or they will break. Be very gentle. This is GENTLENESS. Now you can taste your lollipop. Now we have an idea of what Love, Joy, Peace, Patience, Kindness, Goodness, Faithfulness, Gentleness and Self-control feel like. David, when he was a shepherd. What is a shepherd? (A shepherd is someone who takes care of sheep.) David eventually grew up to become one of the greatest kings in Israel. David came to realize that the care he gave as a shepherd to his sheep reminded him of how God cared for him. But not only for him, but for all those who follow the Lord. God helped David write Psalm 23. In it we can learn so much about our loving Shepherd-King. Do you know that the Bible refers to Jesus, our King, as the Good Shepherd? Learn more about our Psalm 23- Good Shepherd Bible Lessons for Children. Pentecost Lesson: I Got the Power! Person 2: What are you doing? Person 1: I'm getting strong in the Lord. Person 1: Yup, I want to obey God and tell my friends about Jesus, but I'm not too good at it. So, I'm working out. I'm weak in my faith. Person 2: That's a great goal. It's important to be healthy so we can tell others about God, but what you're doing won't make you strong in Jesus! Person 2: Because God has a better and more powerful way to make us strong in him! After Jesus rose from the dead, and before returning to heaven, over the course of forty days he showed himself to hundreds of people, teaching them about God's kingdom. On one of those days, when Jesus was eating with his followers, he told them to go to Jerusalem and wait for a special gift from God to make them powerful. Let me read what the Bible says. His followers obeyed Jesus and returned to Jerusalem. Then something really amazing happened! Listen to what happened next. God sent the Holy Spirit to live in the hearts and minds of his followers. The Bible says those who trust in Jesus and follow him can have that same kind of power that raised Jesus from the dead! In fact, the word for power, is the same word we use for dynamite! Person 1: Now that's powerful! I need that kind of strength! Person 2: Yes, we do! Let's pray and thank God for his Holy Spirit power! 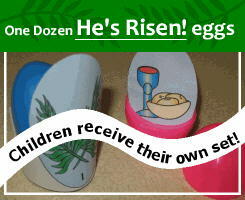 Get more Children's Sermons like this; learn more about It's in the Bag---52 Bible Talks for Children's Ministry. When you hear the rushing wind sound and see the tongues of fire, let them serve to remind you of the Holy Spirit descending on believers at Pentecost, giving them the power to serve Jesus and to tell others the Good News! Today, God's Holy Spirit power is available to all who trust in Jesus as their Savior and Forever Friend (Romans 8:9-10). Where will you spend eternity? Are you going to heaven?